In the present time, content marketing is one of the best ways to promote your business, especially with the guest posting. It is highly effective in getting more readers towards your post thus improving the visibility and getting their attention. There are so many popular guest blogs where you can post and get the immense amount of traffic. Usually people are of the view that guest blogging is not good but on the contrary, it gives strength to your SEO strategy and boosts it by leaps and bounds. Almost all the SEO Specialists are using Guest Blogging as the best technique of content marketing. As per the current guidelines, Google is very strict with the kind of content that is available on the websites or posted on other portals. If your content is fresh, full of quality and has the right keyword density then nothing can stop you. It is all about how you use the things to your benefit and get the most out of them. Guest blogging usually has two advantages associated with it. Secondly, there are high chances to get quality backlinks as well. But getting started with guest blogging is not easy as different blogs have their own criteria to accept the blogs. So you need to fulfill all of them so that they post your articles and help you to grab the attention of more people. So here we are to tell you as for how you can improve your SEO strategy by using the option of guest posting. The first thing is to find the places where guest posts are accepted. Now there are a lot of portals available over the internet but opt for the most popular ones. This is because the popular blogs have more readers and therefore you have high chances that your article too will get a lot of readers and traffic. So it is good to explore the various kinds of portals which are most visited by the people. This is the crucial part because you need to locate the sites which are relevant to yours. This is because you need to get traffic from people who are interested in your business and not just the readers. Therefore, if your search relevant sites you will be able to transform the traffic into sales thus adding to your business goals. Also, there are high chances that you will get quality backlinks which help in increasing the rank of your website. So relevancy is important and you need to focus on that. Once you have shortlisted the portals for guest posts you need to have a look at their guidelines too. It is because all those guidelines need to be fulfilled or else your post will not be accepted. So take time in going through all the guidelines like the minimum and the maximum number of the word count of the articles, their style of writing, kind of topics covered and lots more. Once you are done it will be easy for you to work and get your posts accepted. Another thing that you can do is have a look at the blogs already available on their site. This will give you an idea of how the content has to be framed and what the readers are looking for. Thus you get a lot of help which proves beneficial in writing the posts that are loved by the readers as well as the owner of the blog too. When you have understood the guidelines, start working on the article. Draft it as per the guidelines with the desired number of word count and links added to it. Take time in researching the topic and make sure you have something unique and fresh that will be loved by the readers. Even the visitors love posts that are different and what could be a better way to come up with the latest topics that seek the attention of the people. Usually, most of the sites prohibit you from posting the same article elsewhere so make sure you submit the post first to them and see on which portals it gets distributed. This will take time as the owner will first have a look at the article, go through it and ensure that all the guidelines are met. When everything seems right, they will post your content and distribute it in different places. So you need to keep a check on the website as when the article is posted. Last but not the least when your article is submitted there will be questions and comments from the readers. Do not miss them but try to answer as soon as possible. Do thank them for their valuable feedback and the comments and try building a relationship with them. This will be helpful for your business as the readers will start trusting your business which is very important before you do business with them. So guest blogging can help you to get in touch with more and more readers who wish to know more about your business. By using guest posting, you not only enhance your SEO strategy but you get quality links, more traffic, and higher search ranking. All this accounts for a flourishing business as you get many new people who were not possible in other ways. 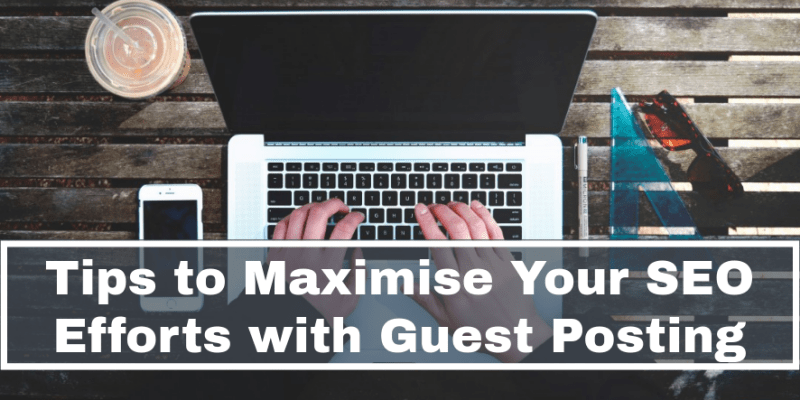 There is no doubt about the fact that guest posting is definitely something that can boost your business by leaps and bounds. If you are looking forward to high-ranking and more traffic, then guest posting is surely the right step towards it. If you are able to implement it well you can definitely get success and see your business going ahead. It is all about how you utilize this form of marketing to the best as everything depends on your content. Make sure you focus on the keywords, relevancy, and optimisation that works best. So why not go for guest blogging and see the difference yourself.